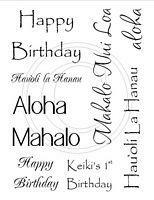 Our Hawaiian Expressions 1 stamp set includes 12 separate stamps: Birthday (3), Aloha (2), Happy (2), Hau'oli La Hanau (2), Keiki's 1st, Mahalo, Mahalo Nui Loa. Our exclusive red rubber stamps are individually cut out and backed with popular static cling foam. Just use them with your acrylic blocks! All Hawaiian rubber stamps are designed and produced in hawaii by Island Paperie. We would love to hear your ideas! Share with us on Facebook!